Superbly smooth and stylish, the 2017 Audi S5 has a load of excitement built into its drive. Not only is the owner/driver going to have a great time driving the new S5, all onlookers will appreciate the coupe lines and special Audi design. 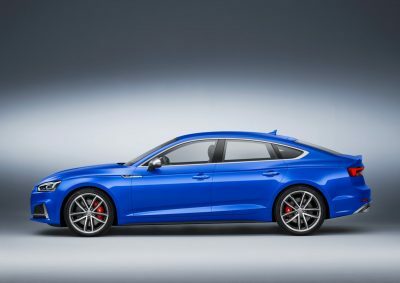 More rounded and with more muscle, the latest Audi S5 is very well sorted in the chassis department and has plenty of performance to match the looks – just as you would expect. Let’s head straight to the facts and find out just how well the Audi S5 goes. Let’s face it; performance is going to be one of the big pulls for driving a brand new S-model A5. To start with, the S5 is an AWD beast that puts down the power-and-traction with incredible ease ad skill. There are serious levels of power that will shunt you right back into your seats if you want this kind of driving excitement. Offering a maximum output of 245 kW (about 15 kW up on the outgoing 3.0-litre model), the powerful 3.0-litre V6 TFSI engine delivers intense driving experiences. A novel mechanically-driven supercharger system adds to the already lush turbo performance. A start-stop system that switches the engine off automatically in different standstill situations, and then switching it on again when the brake is released, allows for some very good fuel economy figures for such a sporty drive. The 2017 Audi S5 Coupe is exclusively available with the fast 7-speed double clutch S-tronic gearbox and Quattro AWD. Quick acceleration is guaranteed with a creamy surge of torque right through the entire rev range. In fact, at least 90 % of the maximum torque of 440 Nm is available across an engine speed range of 2200 – 5900 rpm. The new Audi S5 Coupe accelerates from 0 to 100 km/h in a little less than five seconds on most occasions. This will see off any main challenges at the traffic light sprint! A limited top speed of 250 km/h is now common amongst the German manufacturers, however the limiter can be disconnected to find out that the S5 will happily run passed this figure on the right track. Road holding is sensational, the adjustable chassis being a strong point of an Audi S5. Luxury throughout the elegant interior is evident in the impeccable way the Audi S5 cabin is designed and put together. The gap between Audi and, say, Volvo, BMW or Lexus – in terms of a quality interior is non-existent now, but the S5 remains at the top of its game in all areas of craftsmanship and style. Beautiful leather with accented stitching on the dash, seats and door panels adds to the panache and beauty of the S5 interior. An S5 cabin is a desirable place to spend some time in, and all the electronic gadgets like adaptive cruise control, premium audio, heated seats, Bluetooth, satellite navigation and climate air-conditioning are all standard Audi S5 equipment. Audi’s MMI interface has been around for a wee while now, and it’s still a good one to use. The touchpad input is nice and easy to use, while the striking new instrument cluster looks great. The instrument cluster now boasts Audi’s 12.3-inch virtual cockpit display, and the centre dash has an HD 8.3-inch touchscreen display. The Audi Connect Safety and Service Package is available, and allows owners to lock and unlock the car, check its geolocation, and call up the vehicle status from a smartphone, smartwatch, or even a fourth-generation Apple TV system. The S5 already boasts a very nice sound system, but for those wanting a special musical, a Bang & Olufsen 3D surround-sound system is available as an option. Apple CarPlay and Android Auto connectivity are standard. Space inside the cabin is very good whether you sit in the front or the rear seats. The longer wheelbase in the new S5 model, I’m sure, has helped with an increase in leg room for rear seat occupants. It’s easy to get yourself comfortable – particularly for two large adults sitting in the rear seats. The rear seatback has a 40:20:40 split that enables more flexibility in load carrying duties. On the outside of the car there are a few tweaks on the latest S5 that are worth mentioning. A new, wider front grille, larger corner air inlets on the front fascia, thinner taillight units and a more muscular bonnet are some of the exterior tweaks for 2017. A bit of time was spent re-developing the 2017 S5 model, and the results show in the all-new chassis, aerodynamics and weight loss departments. Considering the light-weight design, the Audi S5 has an amazing drag coefficient of 0.25, making the S5 very slick through the air. Competition for the new S5 comes in the form of the BMW M4 and Mercedes Benz AMG C43 Coupe rivalry. Coupe, Cabriolet and Sportback models of the new Audi S5 are available, all of which are pure joy to drive. 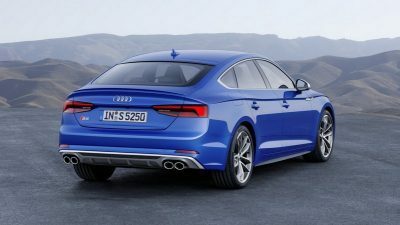 For any more information on the Audi S5 models or, for that matter, any other new car, contact one of our friendly consultants on 1300 303 181. If you’d like some fleet discount pricing (yes even for private buyers! ), we can submit vehicle quote requests out to our national network of Audi dealers and come back with pricing within 24 hours. Private Fleet – car buying made easy!